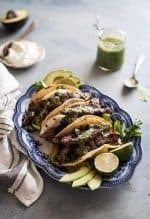 This Paleo fajitas recipe with grilled steak and chimichurri sauce is just about the best tasting and the easiest meal I’ve made in a really long time. I got the idea for these Paleo fajitas at a family reunion a few years ago. My younger brother made grilled steak Philly cheesesteaks. I loved how tender the steak came out and how easy it was to make. So I started experimenting with similar recipes with steak in them and these Paleo fajitas were a natural fit. 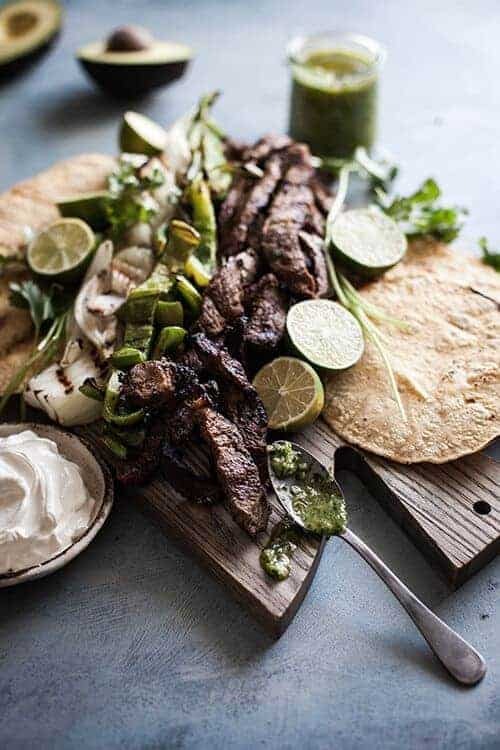 Fajitas are just about one of my favorite dinners of all time. What’s not to love? Steak, onions, peppers, tortillas, and chimichurri. I LOVE all those things. At first, I ate these either dry or with salsa and they just seemed to be missing something. I really like sour cream and nothing was good enough to make me forget about the sour cream. The closest thing I could come to it, without too much effort, is homemade mayo. – and that’s just not the same as sour cream. So I decided to try something totally different than sour cream so I wouldn’t even miss it or think about it. Since I already love chimichurri and often put it on my pork roast, I thought I would give that a try. I’m glad I did. The chimichurri gives it a fresh, herby flavor and keeps it from being dry. My husband and I both LOVE it. My husband generally drinks the leftovers or eats it the next day anyway he can think of. It’s actually really good on eggs, among other things. This is a good excuse to try different cuts of meat you may not have tried before, like skirt steak and flank steak. They not only taste great, but they are generally quite a bit less expensive. I don’t think it’s because they don’t taste good, just that people don’t know how to use them, so the law of supply and demand keeps the cost down. Bunches of cilantro are really affordable at the grocery store like sometimes 2 for $1. 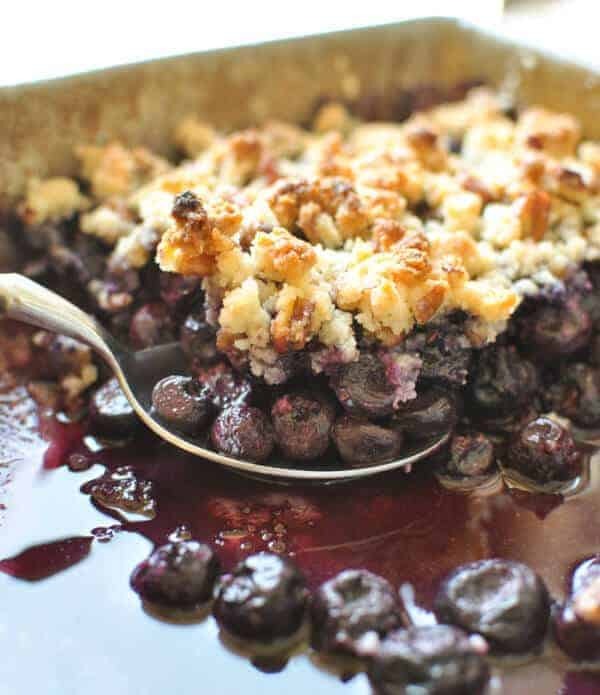 So you have no excuse not to use the fresh, good stuff. You don’t have to marinade the steak at all, but it really does taste better the longer you marinade it. An hour is a pretty good amount of time. When I’m thinking ahead and all, I think to start the steak marinading before I go to bed. Then when I go to make dinner the next day, a bunch of the work is done. You certainly don’t need to be on a Paleo diet to enjoy these fajitas. If you are, these Paleo tortillas will work well with this recipe. If not, you could grill some corn or white tortillas to go with these and add in some sour cream. 9 of the Best Paleo Grill Recipes – Get That Grill Heated Up! These Paleo fajitas are easy and flavorful. I used to be so nervous about making fajitas, but now I make them all the time! Place the steak in a bowl, and the peppers and onions in another bowl (or Ziploc bag. In a mixing bowl, whisk together the cilantro, lime juice, salt, garlic, chili powder, cumin, cayenne, and oil. Pour most of the mixture over the steak, leaving about a tablespoon to be poured over the veggies. Toss the steak and vegetables in the oil(separately), cover, and let marinate in the fridge for at least one hour. Preheat the grill to medium/high. Lay the steak strips on the hot grill and cook until grill marks have appeared on both sides(flip halfway through cooking) and meat is cooked through. Place the veggies in a grill basket and cook, flipping as needed, until the veggies are soft and lightly caramelized. 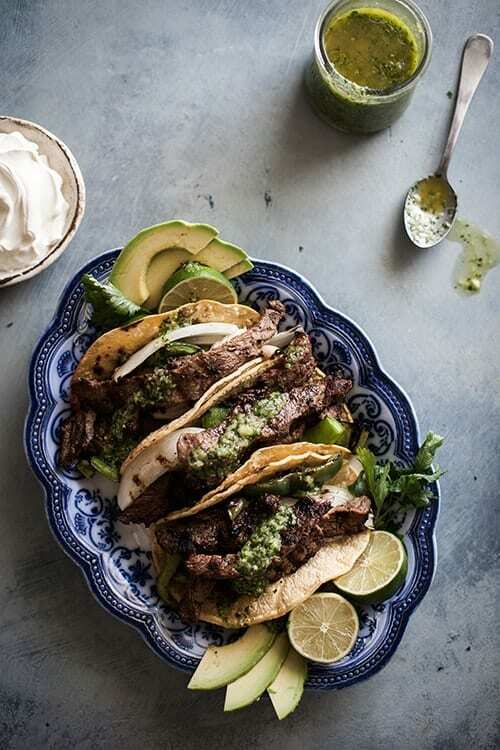 Serve with tortillas, toppings, and cilantro chimichurri. 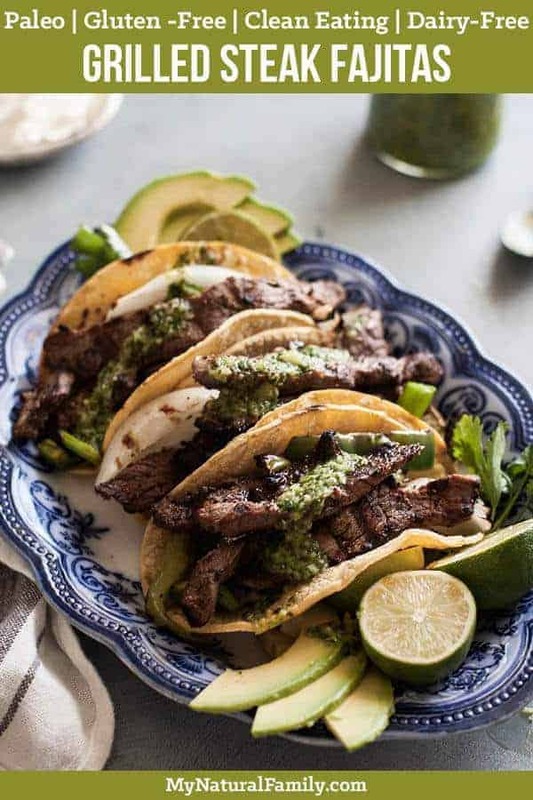 Place all ingredients in a blender and process until the onions and cilantro and finely chopped and sauce is only lightly chunky. Serve with fajitas. That chimichurri sauce is to die for! I absolutely love it on everything. Yum Yum Yum, That’s all there is to say! I love chimichurri too! I had it the first time while traveling through Argentina and now always make it when we cook a steak. Plus it doubles as a delicious salad dressing.